Not all heroes wear capes. Some wear booty shorts. At this point, it's pretty obvious that dress code can be a terrifically complex issue. Some dress codes are in place for trash reasons, while others have more of a safety mandate behind them. One dude in Texas has earned major claps from the internet for helping a female friend in the middle of a dress code emergency. Andrew Nguyen is currently a student at The University of Texas at Arlington along with his friend Diana Le. While in the middle of a study session, Diana started getting worried about an upcoming quiz she had to take. For safety reasons, students aren't allowed to wear open toed shoes or the athletic "booty shorts" that Diana was sporting. She asked around and could find no one to trade pants with her for the quiz. That is, until Andrew stepped in. 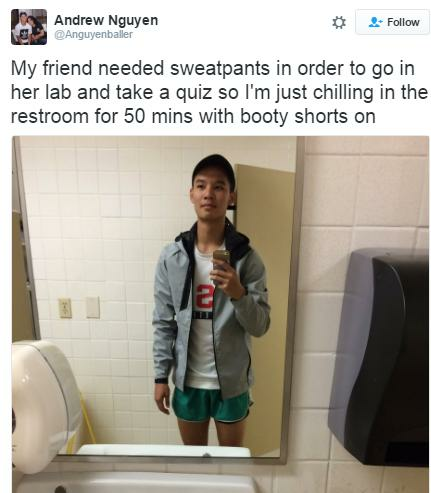 While Diana took her quiz, Andrew waited around in the bathroom in her shorts like a true hero. Although Andrew thought he was just helping out a friend, people are SO into his act of kindness. Okay, Andrew. We're not sure if we'll ever be stuck in this EXACT situation but can we keep you on speed dial for other emergencies? QUIZ: Which Female Superhero Are You, Really?